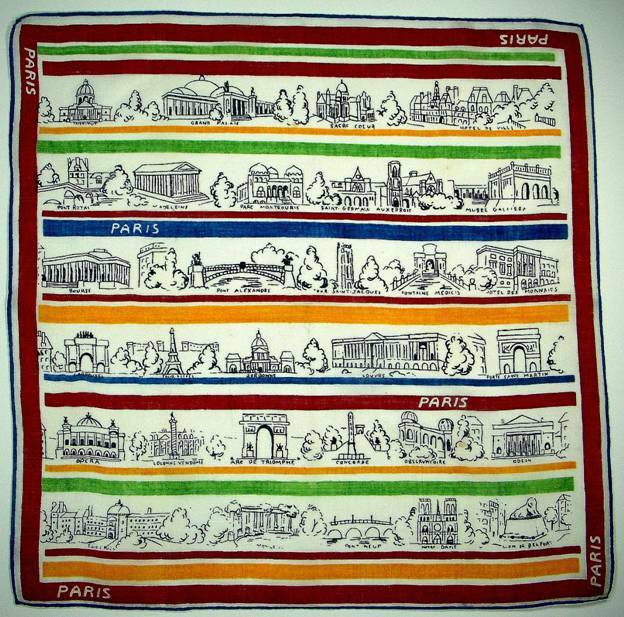 If you’ve read Parisian Romance you’ve already encountered at least one of these handkerchiefs. They have such an interesting provenance, however, I decided to give them their own mini-blog. Often when I present to audiences, I explain I feel as though I’m on a Search and Rescue Mission to save these small harbingers of history. Needless to say, there are thousands of us Search and Rescue folks around the world, and I recently met two more, a couple from Tennessee from whom I purchased these hankies. 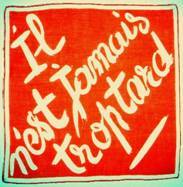 When I spied this bold and brilliant admonition “It’s Never Too Late” (what a great reminder to carry in your pocket!) I was over the moon. If you’re at a point where you need to be reminded of this missive, be it for personal or professional reasons, you’re also probably at a juncture where it needs to be fireworked in brilliant orange into your psyche -to never give up. One wonders if the owner gifted it to herself when her spirit needed bolstering, or if she received it from a supportive friend. I believe the former, and you’ll discover why when you read the story of the hankie’s adventuresome owner. “This small lot of items was acquired at an estate sale in Middle Tennessee in the summer of 2014. The items were mostly odds and ends, but enough to realize that there was a much ‘bigger’ picture. Among the items were several table linens that had the name Virginia Simmons Nyabongo on hand sewn labels affixed to the linens. This put us on a search of just who Nyabongo was. There had been a mention of a “princess’ during the auction. A search found that Virginia Lee Simmons Nyabongo had been born in Baltimore in 1913, and grew up in Washington, D.C., West Virginia and North Carolina, where she was raised by her grandmother. She received a B.A. from Bennett College in 1934 and a Masters and Ph.D. from the University of Wisconsin in 1937 and 1944 respectively. [No small feat in that era.] She served as Dean of Students at Bennett, 1941-42, and served for several years as director of Student Personnel and Professor of Modern Foreign Languages, particularly French, at Tennessee A & I College in Nashville. In 1942, she married Akiki Nyabongo from Uganda, East Africa. Apparently the wedding was an American wedding and quite elaborate. We do not know if she had a separate wedding in Uganda where her husband was a prince. He also was an academic and received his education at either Harvard or Yale. Based on the belongings that were discovered, Nyabongo traveled extensively and had a great interest in art. Some of her artwork was discovered with these items discussed. [You can find some of her watercolors on line.] It is unclear if she had children, but there was an unused baby book among the items. Two address books were among the lot with addresses of persons all over the world. It is known that she owned homes in North Carolina, and Nashville Tennessee, not far from Fisk University, where she was a key player. She was active in public speaking and traveled extensively to speak on a variety of issues. In 1952, her book Les Palmiers was published. [also available online in paperback for $275.00!] She was on the ballot for Governor of Tennessee during the 1970’s. It is not clear if she actually ran a campaign or if she was a write-in candidate. There was one lengthy piece of beautiful material embroidered with gold thread that was likely part of the attire she was required to wear for state events in Uganda. She apparently also loved opera, and we found a pair of sheer blue opera gloves. Her personal garments attest to the fact that she was tall and slender. We would assume she did a great deal of entertaining based on the fact most of the lot was composed of table linens, and this was well after the best of her estate had been disbursed after her death in 2005. 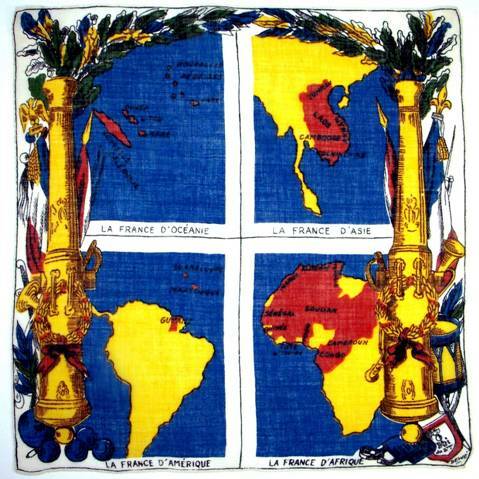 Now that I know a bit more about Virginia Nyabongo, I’m not surprised to find this terrific hankie depicting the French speaking territories around the world, particularly in her adopted Africa. No doubt she spent many happy days touring the wonderful sights of Paris as well. 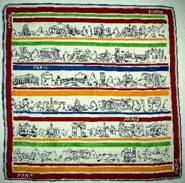 The artist below managed to showcase thirty significant historical monuments on one hankie. We saw many of them in Paris Landmarks. Considering her numerous homes as well as intercontinental travels, it’s interesting to note what she chose to cherish and keep, rather than discard in some foreign land. 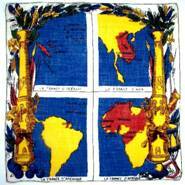 These hankies obviously held significance for her. They only whisper an introduction to the story of her life, a life we’ll now never know, but which we can surmise was filled with education, travel, romance and adventure. Other Search and Rescue mission which hold particular significance for me include handkerchiefs from WWI and WWII , but truth be told, people have shared heartwarming stories about bridal handkerchiefs, Christmas handkerchiefs, children’s handkerchiefs, Mother’s Day hankies and more. There seems to be no end to the memories held within the folds of a handkerchief. Often I have not included the stories, believing people were more interested in the images themselves, but thanks to Virginia Nyabongo, courtesy of Glenda Browning, I hope to include more stories in the future. So interesting!!! Love the story behind the hankie!!!! I love how you unravel so much in your work! I ALWAYS LOVE A GOOD STORY.. I DON’T MIND IF A HANKY IS NOT MINT, AS LONG AS IT HAS GREAT CHARACTER! THANKS AGAIN FOR SHARING THESE. !